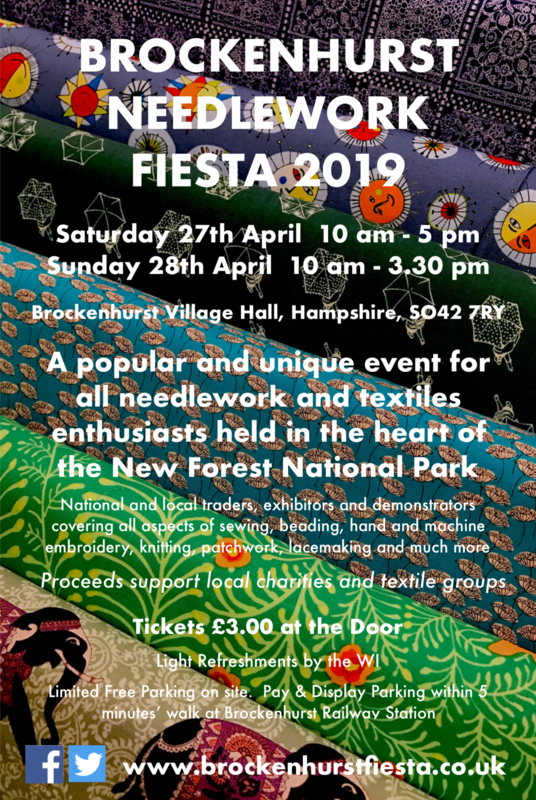 We hope you like our website which is designed to make it easier for you to find out about Brockenhurst Needlework Fiesta. If you can't find what you're looking for, please take a look at our Frequently Asked Questions page and do get in touch if you have any other queries or feedback - we would love to hear from you! at Brockenhurst Village Hall, Highwood Road, Brockenhurst, SO42 7RY. In addition to our textile art exhibitors and demonstrators, both local and national traders will be on hand to share their infectious enthusiasm, invaluable knowledge and experience and to supply you with all the specialist books, tools and materials you could possibly need. Light refreshments by the WI are available to purchase including delicious home made cakes! Tickets cost just £3.00 at the door. Proceeds from the event are used to support local textile groups and raise funds for the local primary school and Village Trust for the benefit of the wider community.